On November 27, 2018, a group of over sixty individuals and organizations, including environmental groups and academics, submitted a rulemaking petition requesting that the EQB establish a cap-and-trade program to reduce greenhouse gas (GHG) emissions in Pennsylvania. For a more detailed explanation of this petition, please refer to our prior article. The proposed Pennsylvania cap-and-trade program would cap GHG emissions from certain categories of sources, with the cap declining each year by 3 percent of 2016 emission levels. This 3 percent reduction would ultimately result in net zero GHG emissions by 2052. PADEP would distribute allowances equal to the cap, with each allowance equal to one metric ton of CO2 equivalent (CO2e). Most of the allowances would be distributed through an auction and could be freely traded in an open market. Three categories of sources would be required to obtain and surrender their allowances each year and participate in the auction: (1) sources that are required to report their direct emissions under EPA’s Mandatory Greenhouse Gas Reporting Rule, which includes a broad range of facilities in a number of industries, including petroleum, natural gas, cement, glass, iron, steel, landfills, and lead production; (2) distributors of fossil fuels in Pennsylvania; and (3) entities that deliver electricity to Pennsylvania generated with fossil fuels at facilities outside of Pennsylvania. The petitioners assert that the EQB has the authority and duty to promulgate the proposed regulation under Article I, Section 27 of the Pennsylvania Constitution, also known as the Environmental Rights Amendment, as well as under the Pennsylvania Air Pollution Control Act. This is the second petition submitted to the EQB in the past five years asking the EQB to establish a program to reduce GHG emissions. The EQB, under the Corbett administration, rejected the prior petition, which had requested a 6 percent reduction in CO2 emissions per year until 2050, explaining that a plan to reduce GHG emissions requires a national solution and that PADEP is already taking some measures to reduce GHG emissions. Shortly after the petition was submitted, Governor Wolf publicly stated that he is considering whether to support the petition. Then, on January 8, 2019, Governor Wolf signed an executive order setting a statewide goal of reducing GHG emissions by 26 percent by 2025 and 80 percent by 2050 from 2005 levels, which are the same levels of reduction outlined in the Paris Climate Agreement. 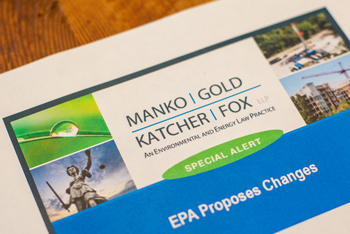 In 2019, expect PADEP to deliberate internally and potentially request feedback from stakeholders on the merits of the petition and PADEP’s constitutional and statutory authority to enact such a rulemaking.